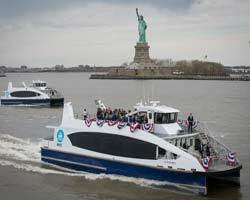 The first batch of the Incat Crowther-designed ferries that will comprise Hornblower’s New York City (NYC) Ferries network have officially entered service. These deliveries kick off what should prove to be an exciting new era for the city, with 21 neighbourhoods set to be connected via water transit across the city by the end of 2018. The first vessel to be delivered by Alabama’s Horizon Shipbuilding, christened Lunch Box (the moniker having been selected by NYC schoolkids, as part of a naming competition) and pictured above, features an overall length of 26m (or 24.5m lwl), an overall breadth of 8m, a draught of 1m (hull) / 1.85m (prop) and a depth of 2.7m. The vessel is designed to carry up to 150 passengers and two crew, with 119 seats (in addition to wheelchair and baby stroller slots) located in the open main deck cabin, and 28 external seats located on the upper deck. Onboard capacities, meanwhile, include 5,680litres of fuel oil, 1,900litres of sullage and 757litres of fresh water. The ferry is powered by two Baudouin 6M26.3 main engines, each Tier 3-compliant and rated 599kW at 2,100rpm. These drive a pair of five-bladed propellers and enable a cruise speed of 25knots, increasing to more than 27knots max. To keep the waterways clean, Lunch Box and her forthcoming sisters have replaced typical solvent-based paints with vinyl coatings. Meanwhile, Louisiana’s Metal Shark has successfully delivered four of these ferries to NYC, among them Sunset Crossing, which reportedly undertook the first ever ferry crossing on the network’s Rockaway route, setting sail from Far Rockaway, Queens at 5.30am on 1 May. She has subsequently been joined in the Big Apple by the Metal Shark-built Waves of Wonder, Happy Hauler and Great Eagle. At the time of writing (early June), two further ferries – one with a confirmed moniker of Owl’s Head, the other yet to be named – had just left Metal Shark’s yard and were en route to NYC. The remainder of the vessels in the series will be delivered by Horizon and Metal Shark between summer 2017 and late 2018. At present, three of the six NYC Ferries routes are active, namely the Rockaway Route, East River Route and South Brooklyn Route. These will be complemented by the Astoria Route in August this year and the Lower East Side and Soundview Routes in summer 2018.